Google Maps is a cool online way of exploring different places and regions around the world. Zoom is most important routine while using Google Maps. It can be tiring to zoom Google Maps using default slider or click to zoom action. You make this easy while zooming to specific locations on Google Maps by drawing rectangle and using drag N zoom feature. 1. Goto http://maps.google.com & login into your Google account. 2. Click Labs icon with ‘new’ text (as marked in screenshot below). 3. 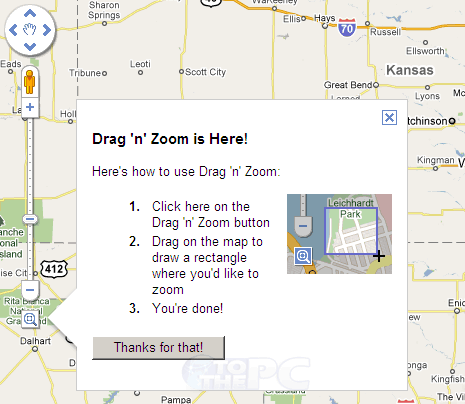 Then click to select ‘enable’ option for “Drag N Zoom” Google Maps labs feature. 4. Now click new ‘Drag N Zoom’ button at the bottom of zoom slider & draw rectangle with mouse to zoom to specific location on Google Maps. This for sure is easier and quicker method to zoom on Google Maps.